Pop Quiz: When do people buy tires? Answer? Whenever they need them. There is no tire season or scheduled time to buy as there is with Christmas gifts or weekly groceries. Because there is no way to predict when drivers will need new tires, you have to market your business continually. 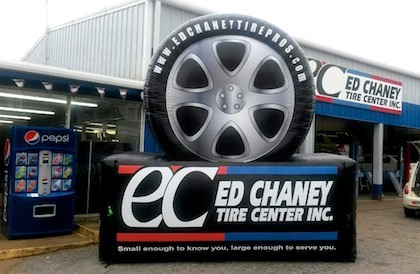 Top-of-mind awareness is what drives Ed Chaney’s tire business, and he’s smart enough to realize what that means: promote your company at all times so that when someone has a blowout, notices worn tread or decides they want snow tires, they think of you first… you are at the top of their mind. Ed explains his process and why he decided to incorporate a cold-air inflatable into his marketing plan. “We support our community through sponsorships, and in the past we have put a banner or table at an event. Now we can place the inflatable in a high traffic area and have a 24/7, larger-than-life representative on site. Looking for an inflatable for automotive marketing? Fill out a free estimate form for details and pricing!